Vault's PKI secrets engine can dynamically generate X.509 certificates on demand. This allows services to acquire certificates without going through the usual manual process of generating a private key and Certificate Signing Request (CSR), submitting to a CA, and then waiting for the verification and signing process to complete. The steps described in this guide are typically performed by a security engineer. Organizations should protect their website; however, the Traditional PKI process workflow takes a long time which motivates organizations to create certificates which do not expire for a year or more. Use Vault to create X509 certificates for usage in MTLS or other arbitrary PKI encryption. While this can be used to create web server certificates. If users do not import the CA chains, the browser will complain about self-signed certificates. Creating PKI certificates is generally a cumbersome process using traditional tools like openssl or even more advanced frameworks like CFSSL. These tools also require a human component to verify certificate distribution meets organizational security policies. Vault PKI secrets engine makes this a lot simpler. The PKI secrets engine can be an Intermediate-Only certificate authority which potentially allows for higher levels of security. Or you can use the Vault Playground environment. In this guide, you are going to first generate a self-signed root certificate. Then you are going to generate an intermediate certificate which is signed by the root. Finally, you are going to generate a certificate for the test.example.com domain. Each step will be illustrated in three ways but you only need to follow the steps for one. In this step, you are going to generate a self-signed root certificate using PKI secrets engine. Tune the pki secrets engine to issue certificates with a maximum time-to-live (TTL) of 87600 hours. Generate the root certificate and save the certificate in CA_cert.crt. This generates a new self-signed CA certificate and private key. Vault will automatically revoke the generated root at the end of its lease period (TTL); the CA certificate will sign its own Certificate Revocation List (CRL). The following example mounts the pki secret engine. Generate the root certificate and extract the CA certificate and save it as CA_cert.crt. NOTE: The following command uses jq tool to parse the output JSON. You can install jq or manually copy and paste the certificate in a file, CA_cert.crt. Select the PKI Certificates radio button, and click Next. Select More options to expand and set the Maximum lease TTL to 87600 hours. Leave CA Type as root, and Type to be internal. Enter example.com in the Common Name field. Expand Options and then set TTL field to be 87600 hours. Click Copy Certificate and save it in a file named CA_cert.crt. Click the URLs tab, and then set the Issuing certificates to http://127.0.0.1:8200/v1/pki/ca, and CRL Distribution Points to http://127.0.0.1:8200/v1/pki/crl. NOTE: To examine the generated root certificate, you can use OpenSSL. Now, you are going to create an intermediate CA using the root CA you regenerated in the previous step. Tune the pki_int secrets engine to issue certificates with a maximum time-to-live (TTL) of 43800 hours. Generate an intermediate using the /pki_int/intermediate/generate/internal endpoint. Sign the intermediate certificate with the root certificate and save the certificate as intermediate.cert.pem. NOTE: The API request payload should contain the CSR you obtained. NOTE: The format in the payload specifies the format of the returned data. 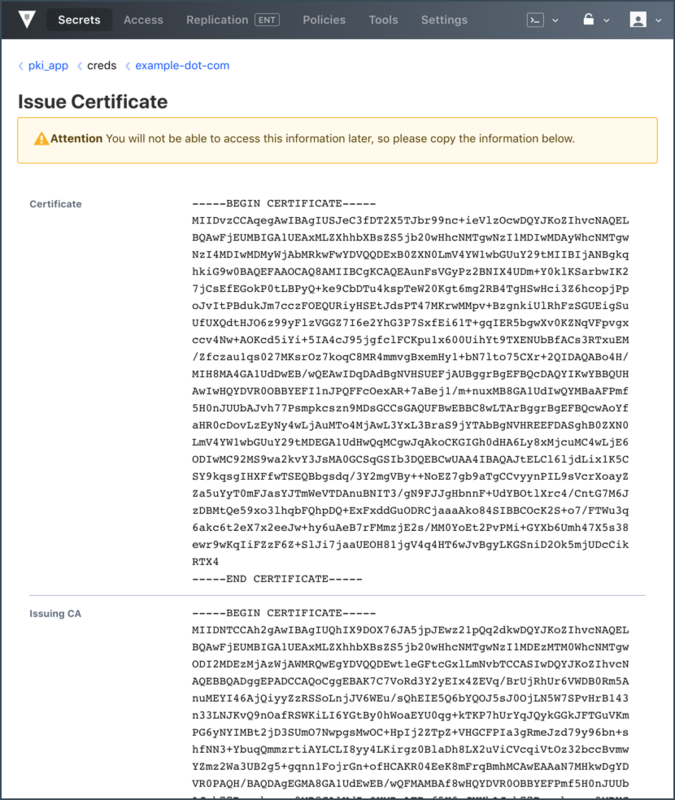 When pem_bundle, the certificate field will contain the certificate. 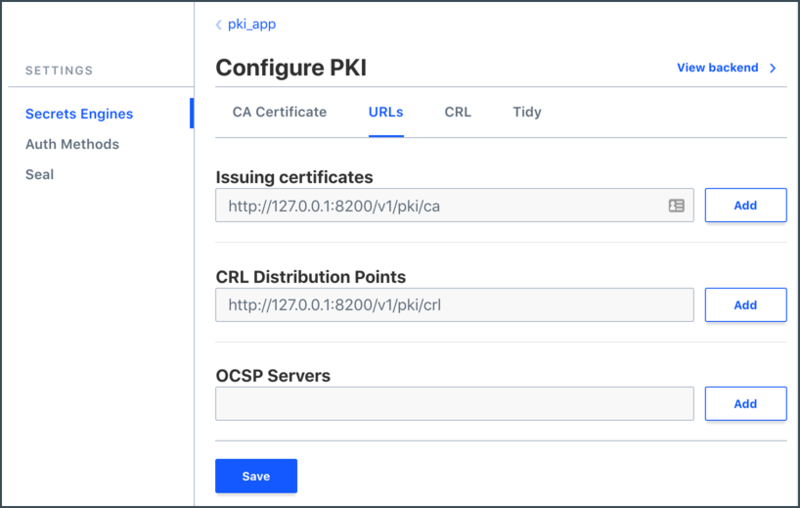 Once the CSR is signed and the root CA returns a certificate, it can be imported back into Vault using the /pki_int/intermediate/set-signed endpoint. NOTE: The API request payload should contain the certificate you obtained. Select Enable new engine in the Secrets tab. Enter pki_int in the Path field. Click More options to expand and set the Maximum lease TTL to 43800 hours. Select intermediate from CA Type drop-down list. Enter example.com Intermediate Authority in the Common Name field. Enter 43800 in the TTL field, choose hours and then click Save. Click Copy CSR and save it in a file, pki_intermediate.csr. Return to the pki in the Secrets tab which is the root CA. Select Configure and then click Sign intermediate. Paste in the CSR in the Certificate Signing Request (CSR) field. Enter example.com in the Common Name. Select pem_bundle from the Format drop-down list, and then click Save. Click Cooy Certificate and save the generated certificate in a file, intermediate.cert.pem. Select pki_int from the Secrets tab to return to the intermediate CA. Select Configure and then click Set signed intermediate. Paste in the certificate in the Signed Intermediate Certificate field and then click Save. A role is a logical name that maps to a policy used to generate those credentials. It allows configuration parameters to control certificate common names, alternate names, the key uses that they are valid for, and more. In this step, you are going to create a role named example-dot-com. Create a role named example-dot-com which allows subdomains. 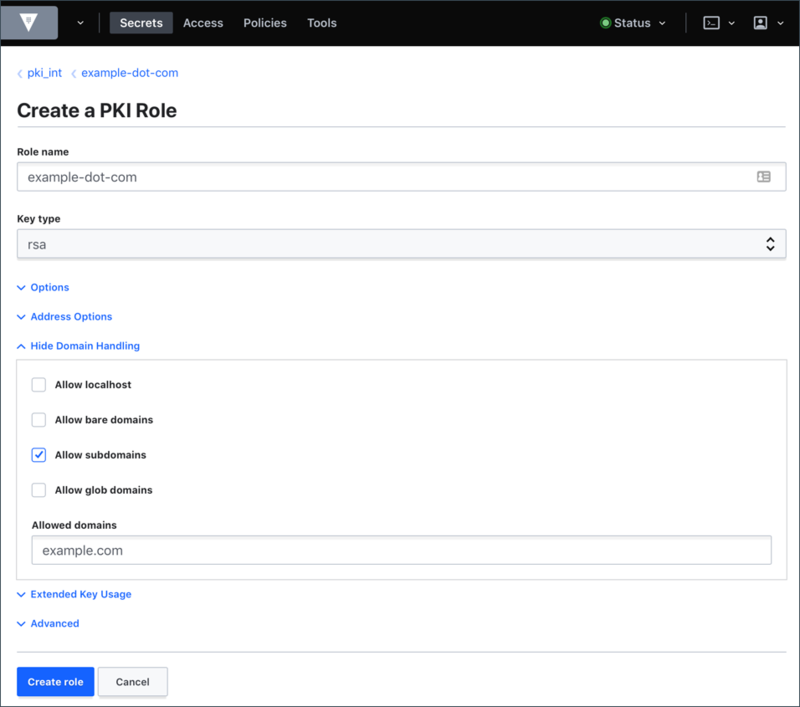 Click pki_int and then select Create role. Enter example-dot-com in the Role name field. Expand Options and then set the Max TTL to 43800 hours (5 years). Select Hide Options. Expand Domain Handling and then select the Allow subdomains check-box. Enter example.com in the Allowed domains field. Keep certificate lifetimes short to align with Vault's philosophy of short-lived secrets. $ vault write pki_int/issue/example-dot-com common_name="test.example.com" ttl="24h"
The response contains the PEM-encoded private key, key type and certificate serial number. Invoke the /pki_int/issue/<role_name> endpoint to request a new certificate. Select pki_int from the Secrets Engines list. Enter test.example.com in the Common Name field. Expand Options and then set the TTL to 24 hours. Select Hide Options and then click Generate. The response contains the PEM-encoded private key, key type and certificate serial number. Click Copy credentials and save it to a file. NOTE: A certificate can be renewed at any time by issuing a new certificate with the same CN. The prior certificate will remain valid through its time-to-live value unless explicitly revoked. If a certificate must be revoked, you can easily perform the revocation action which will cause the CRL to be regenerated. When the CRL is regenerated, any expired certificates are removed from the CRL. In certain circumstances, you may wish to revoke an issued certificate. $ vault write pki_int/revoke serial_number="48:97:82:dd:f0:d3:d9:7e:53:25:ba:fd:f6:77:3e:89:e5:65:cc:e7"
Invoke the /pki_int/revoke endpoint to invoke a certificate using its serial number. Select the serial number for the certificate you wish to revoke. Click Revoke. At the confirmation, click Revoke again. Keep the storage backend and CRL by periodically removing certificates that have expired and are past a certain buffer period beyond their expiration time. To remove revoked certificate and clean the CRL. Invoke the /pki_int/tidy endpoint to remove revoked certificate and clean the CRL. Select the check-box for Tidy the Certificate Store and Tidy the Revocation List (CRL). Check out the Streamline Certificate Management with HashiCorp Vault webinar recording.